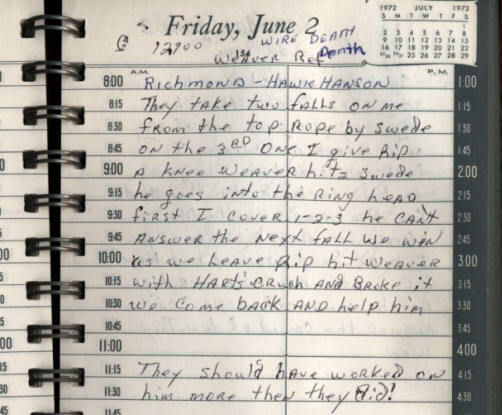 Brad Anderson, the son of the late legendary Gene Anderson, recently let us take a look at a couple of his Dad's journals that were kept while on the road working for Jim Crockett Promotions in the early 70s. Gene kept notes on every match he wrestled, and made detailed descriptions of many of the finishes used in these matches. It is a fascinating peek into life on the road, as well as a look at how the territory ran back then. Gene and Ole were often involved in different programs with different teams in different sections of the Mid-Atlantic territory, all at the same time. 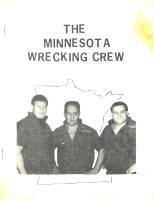 In the early 70s, a fan in Minnesota named Pam (we don't have her last name) briefly published a newsletter that kept up with the goings-on of all three members of the Minnesota Wrecking Crew - Lars, Ole, and Gene. Her newsletter published in the summer of 1972 listed results from Gene and Ole's ring wars in the Mid-Atlantic territory, and a certain series of matches caught my eye because of the angle involved. It is a variation of an angle Ole would use many times over the years, especially during his booking tenure for Georgia Championship Wrestling in the mid-to-late 70s. that chronicled the exploits of the Anderson Brothers. I decided to see what references Gene made in his journal for these matches. I've paired those with the actual newspaper clippings and results from some of the cards mentioned, courtesy of the collection of Mark Eastridge. Together, they paint a picture of a great series of cards that told wonderful stories in the classic old-school wrestling tradition. Beginning in early April of 1972, the Andersons began feuding with Rip Hawk and Swede Hanson in a heel-vs.-heel match up that caught fire all over the territory and lasted well into the summer. In many of the matches, the referee would get knocked out of commission and the matches were ending in double disqualifications and brawls outside the ring. It was decided that a cage was needed to contain all four. This took place in Richmond, VA on Friday, June 2, 1972. I doubt Weaver actually hit the referee with a cane; something got lost in the translation of this report from North Carolina to Minnesota. But it's fair to assume that the referee went down in the melee that was ensuing inside the cage, and Weaver came down to replace him. Gene Anderson has a reference to Weaver as referee in his journal, although Weaver was not billed as a special referee in the match. Gene also describes the finish. 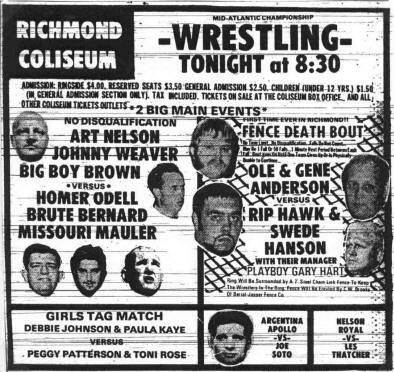 After the match, Hawk and Hanson jump Weaver, and the Andersons make the save, setting up the main event two weeks later.